Whether part of a standard fireplace or as a ‘hole in the wall’ installation, the two stylish Riva Profil 2 models both feature the glow and flames of a highly realistic gas log fire. 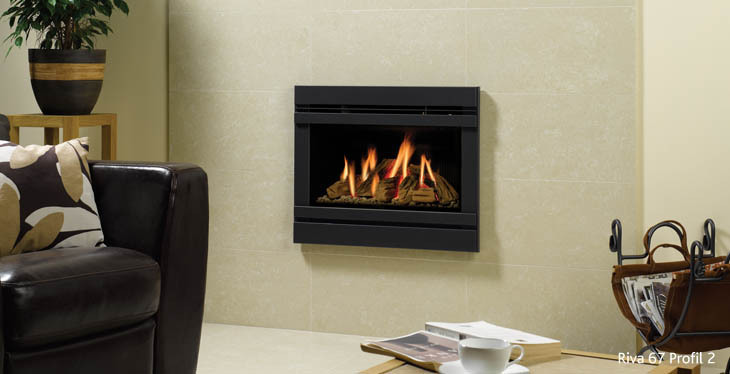 This provides not only a remarkable focal point for your room but an effective heating appliance as well. To maximise your décor options, the Profil 2 frame is available in two outstanding finishes: Graphite or Iridium. All gas Riva 53 and 67 models come with manual operation and the option to upgrade to a Standard remote control (allowing you to adjust both the flame height and heat output) or the Programmable remote control (with additional thermostatic and timer functions).